It is almost summer! I cannot wait. Adalyn and I have been talking about swimming for the last few months and we cannot wait until we get to jump into our local pool at our park, visit the different lakes around Michigan and swim at my parent's farm. 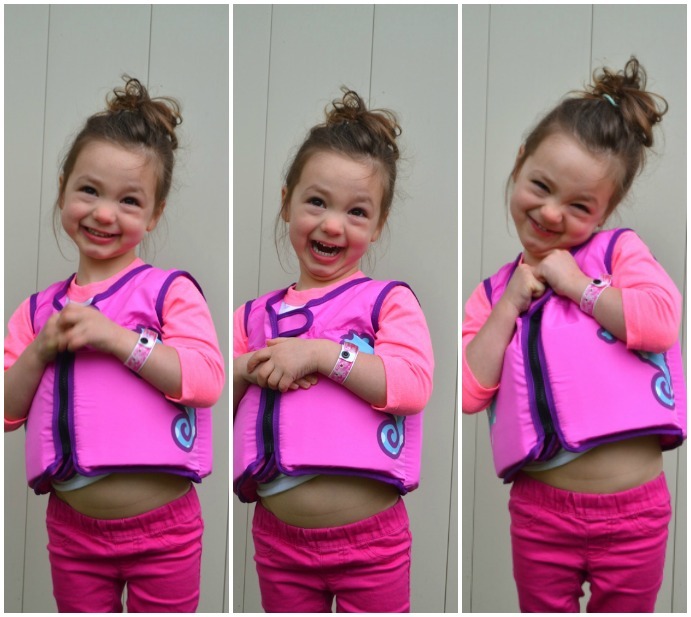 My daughter is now 2 1/2 and I really want to focus on teaching her to be more confident in the water this year. Last year, Adalyn took swim lessons at our park pool. Troy took her to them since he is a teacher and is off work in the summer. Adalyn loved the classes which were only about 30 minutes long and it taught her to get used to the water more. The classes focused on playing fun games in the water and Troy was in the water with her the whole time. I really want to get her into swim lessons this summer but haven't quite figured out how to do so with Troy having to watch Oliver as well and me going back to work. Water safety and learning how to swim is super important to me, especially since we live near so many places with water. I have taught Adalyn never go to into the water without an adult present and never leave her unattended near water- even in the bathtub- you just never know when something could happen. I think that learning how to swim at a young age is important for safety as well as developing skills in the water that take time to learn. I am stoked for going to the pool and lakes all summer! It has been awhile since Adalyn was in a pool (we only got to go to a place one time this winter) so I know that it will take her a couple times to get more comfortable with the water. I know she will love it though! We have been using SwimWays products since Adalyn was a baby. The SwimWays Baby Spring Float is perfect for having a baby or young toddler float in in the water. She really liked being in this. Now that we have another child, he will use that as well to have fun in the water. We were sent some of the SwimWays products which are awesome in helping a toddler feel more confident being in the water and to improve their swimming skills. They have a product called the Swim Sweater which has a circular design to go on your child's chest for stability. It works for swimming upward and a forward stroke. It has sun sleeves for UV protection. We were sent the Swim Vest which has sturdy foam insets to help with flotation. It has UV 50+ sun protection for sun safety. I know that we will get a lot of use out of this this summer at my parent's pond at their farm and at the lakes especially. It just needs to get a tiny bit warmer in the water! It is for kids ages 2-4. These are the next step up from the baby float and will help Adalyn improve her swimming. We were also sent the Power Swimr from Swim Step Three which provides graduated support for kids 3-6. It helps you float and has 9 removable floats to adjust to your child's swimming ability. We will probably use this one next summer. The third Saturday of May was National Learn to Swim Day and Swimways helps to promote water safety and helps kids learn to swim. The 6th annual Swim Day just took place! You can find the SwimWays products at Toys R Us in-store and online.